Yesterday, I decided to try out the live function in Facebook. My first proper interactive video tutorial. Did you catch me live? How did you like it? For me, I had a great time. Being able to interact with those viewing was fun and of course, it's fun sharing what I know bout baking.. and my love for food! 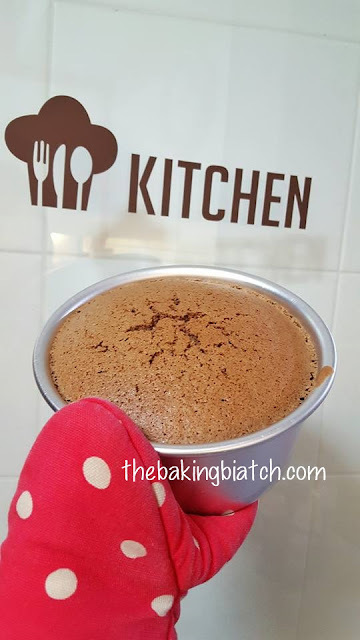 I took about 40 minutes to take viewers on a session in my kitchen where I baked a Chocolate Chiffon Cake. Wanting to serve more portions, I baked them in 6" cake tins. The recipe works well for a 20 or 22cm chiffon tin. You'd get a nice and tall cake. This recipe would take about 30 minutes to prepare (I took longer cos' I talked so much!) and about an hour to bake. Cooling would take bout 1/2 an hour so do set aside 2 hours to do up this delectable cake! It'd rate it a difficulty level 3 out of 5. 1) Sift cake flour, cocoa powder and baking powder. Set aside. 2) Separate eggs. Ensure that mixing bowl for whites is completely clean and dry. 3) Into the yolks, add 1/2 the sugar (60g). Whisk till thick and light. 4) Add 1/3 chocolate milk and whisk. 5) Add 1/3 flour mixture and whisk. 6) Repeat till milk and flour have been used. 7) Add oil and vanilla bean paste to yolk mixture. Stir/Whisk gently. 8) To the egg whites, add the the other half of the sugar. 9) Whisk till stiff peaks are achieved. 10) Fold 1/3 of the whites into the yolk batter. 11) Pour yolk mixture into egg whites. 12) Fold mixture till a homogeneous batter is achieved. 13) Pour batter into baking tins. Tap the tin onto the counter to remove excess air bubbles. 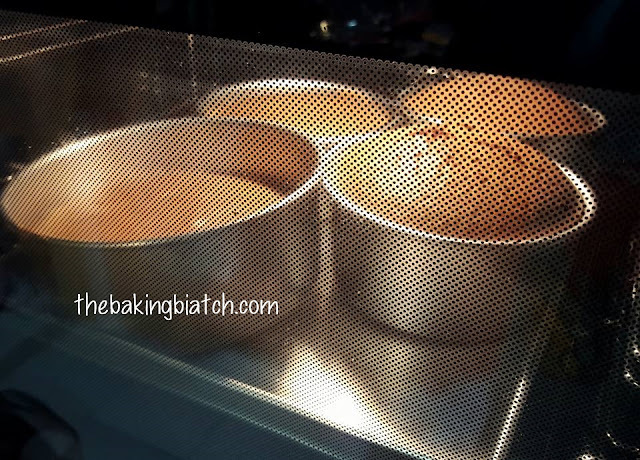 14) Bake cake in pre-heated oven of 150 degree Celsius for 50 - 55 minutes. 15) Invert cake on a raised cooling rack and cool it for 30 minutes or till cake is cool to touch. 16) Unmould cake and enjoy! These cakes were adored by my colleagues! Enjoy them too! Hi Cynthia, I was told by salesperson by a certain electrical retailer that built-in oven will trip if it not use at least once a week. May I know does your the Bosch built oven have this problem? that applies for ALL ovens. If you don't intend to use it (which I don't understand why... if you intend to invest, you might as well make good use of it), you may also heat it up once a month to prevent it from having such an issue. Thank you Cynthia for your response. Oh, I bake quite often but sometimes, for one week or two weeks I might not bake anything at all. I was told by the salesperson that I need to use the built-in oven every week otherwise the trip will occur. Hence, I hesitated installing a built-in. I heard you mention the oven you are using is a good one, that was reason I asked concerning tripping issue. No worries. Maybe you wanna turn it on once a week to let it run if you don't use it? But what I heard was that you just need to heat it up once a month if you're not using it.. but no harm doing it more often than that! Thank you again, Cynthia for answered my query. which type of oil do you use ?